BoxyCharm August 2018 Spoiler Update! We have more spoiler info for the August Boxycharm boxes! Thanks to Yosef, we now know that the August box will have six items! What do you think of the spoiler brands? 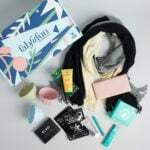 If you sign up now, the July box will be your first box – the waitlist is temporarily lifted! Check out the full spoilers here! I understand bright colors / red toned eyeshadow colors are the IT thing now…but some of us prefer more neutral every day colors. Agreed! I canceled my subscription specifically because of those hideous clown colors. I don’t care if these are on trend. I need something I can wear in normal everyday life and not to a Halloween party! I agree neither of those palettes were actually bright. I was also confused by that. I know Alamar had the blue and greenish shades, but also had 6 others that aren’t at all bright and the crown palette (as much as I hated it) was all boring, brownish, warm but as neutral as a warm palette can possibly be. Maybe the O.P. will explain further. I had to cancel Boxy after this month just because I am wanting New Beauty Rewards really bad can’t have both.Boxy sent email asking if I was sure with the brands for the next box and email said the box is a Retail Value of $100 For August and there are 6 items . More make up brushes! Like eye brushes and setting sprays! I’m going crazy!!! Lol when are they going to show us some spoilers!!!!!!! I know we’re getting Laura Lee, and smashbox. I just want to see an item!!!! Lol. I would love that palette too. The colors are bright and bold – perfect for summer, and then again for holiday party time. That’s the pallet we are getting! I don’t mind palettes but I like color especially purples. I loved the models eye colors in the video.Im so excited! I would love to get the be legendary pucker up 2 lipstick palette by Smashbox! Party Animal palette by Laura Lee is my guess for the eyeshadow. I would love to see some Lorac in our Boxycharm one day. I wonder if kat Von D item will be this box? Where are the spoilers for August????? ?🤔 it’s already half of the month. I have been thinking the same thing! I’d like to re-sub if I could tell if I liked next months box! They recently have not been doing it for me, even offering me a Becca highlighter it just isn’t worth it to me right now. Is anyone willing to trade the Farmacy Vit. C mask for the Dr. Drandt depuffing eye cream? Which is it that you want? I’m trying to find the mask myself. I have the eye gel. I would love to contact further for a great exchange!! Can you give my your email? I really hope so, but I oersonally think the palettes will probably be a variation of the two…fingers crossed though. I think it’s going to be a variation, one or the other, and that a lot of ppl are going to be pretty ticked off when they get that neon colored palette. I don’t care either way as long as the quality is good, but I’ve been hearing tons of ppl complaining abt the too colorful palettes boxy has been sending including the Alamar palette. If ppl thought the Alamar palette was too colorful and then they got the neon L.L. palette I can imagine they’ll be really unhappy. I agree. I watched her video and she said that it isn’t an eyeshadow palette, it’s a pigment palette. Is the difference too big? There’s no difference. It has to do with what the FDA allows as ingredients in eye shadows or in pigments. In Europe there aren’t any issues with these ingredients. The US FDA is woefully outdated in their definitions for some of these ingredients. Either way they’re fine to use as eye shadow. I hope it’s both !!!! I looked at Laura Lee’s IG, and those new mini palletes have amazing swatches!!!!!! Those swatches, if you look at them closely, look like they were manipulated with a wet base, especially the bright ones. You can see around the edges of the orange and yellow swatches that they’re wet underneath. It’s weird. Bright colors aren’t her thing. Idk wht she dis them other than it’s the trendy thing and trends sell. I understand that 🙂 but you don’t want to grow your collection with junk. Also, matte shadows aren’t meant to be used wet or sprayed. That’s a technique for making shimmery shadows shine brighter and have less glitter fallout. My guess is that we are going to get 6 products because smashbox is probably going to end up being a deluxe or travel size. They have started putting the petal metal ones on sale so it might be that version. Last time Smashbox was featured. Still a really good travel size. I’ve seen the Petal Metal products in stores, just wasn’t excited about them enough to purchase. That would keep ppl from getting so upset abt getting colors thw y won’t use aka the neon palette. I would use them myself but I can’t see a majority of ppl using them. I’m so glad I unsubscribed to Palettexybox. not interested in another palette of dumb colors. sorry boxycharm. big thumbs down. Another Pallet????? I just hope it’s very neutral colors and Not the vibrant crazy colors which I can’t use. Why do they give so many pallets??? I just have way too many pallets. I had to give away a bunch already. A. It is palette. B. Boxycharm is known for sending palettes, if you don’t like them maybe you should try a different subscription service. I already do. I subscribe to 5 different subscription Companies. I didn’t say I don’t like Boxycharm (in fact I Love my Boxycharm boxes), I just don’t like pallets. Aren’t I allowed to just dislike something?? I thought Boxycharm put out a statement at the beginning of the year that every box would contain a palette. Someone mentioned something about an upgraded luxury Boxy sub, what is that about? I haven’t seen anything official. It’s launching in September and it’s called boxyluxe… available only to current subscribers. How do we upgrade to the new box? Any news yet?? Thanks for letting me know. I’ve been a subscriber for almost a year now and didn’t get a notice from them about it. They haven’t sent out any official notices. They’ve been doing it all very casually, very laid back and slack like. It’s not inspiring a lot of confidence my part especially after hearing about what happened with the last special box. If this turns into another damned fiasco with some ppl getting to buy 5 boxes and others not getting to buy any I’m going to be so done with boxy. Yes, the way they handled the LE box was horrendous. Hopefully this will be nothing like that. Thanks for letting me know. So Laura Lee premiered 2 mini palettes today. Each are 6 pans. One is neutrals, one is all colors. It looks like the Manny MUA life’s a drag palette but split into 2 palettes with the black and white shadows missing. Idk if boxy will have both for the August box or just the colored one since Joe said specifically the purple shade was from the palette we would be getting, but that’s what I know. I came here to say the same thing. The colors look right, too. hi, which one? The one with neutral colors or the one with bright colors? I couldn’t find the model’s picture. I’m assuming it’s going to be the bright colors. Joe did say the model’s shadow would be in the box and she was wearing a purple-ish shade. I can’t say for 100% sure though. They might choose to include both as variants where some of us get the neutrals and some get the colors. Dang you guys beat me to it I also just came here to post this exact comment about the Wholesaler thing!! I think they were referencing Ulta carrying the brand. I would think maybe one of the two palettes would be in there or possibly some of her lip or eyeliners. I would love a palette though. I’m curious to try her shadows. Target is not a wholesaler, Target is a retailer. Boxycharm is classified as a wholesaler though. @Leslie the cat’s pajama’s palette is way too big to fit in the boxycharm box so I don’t think you have to worry about that. I think it will either be her lipsticks or one of her two mini palettes. i like to comment because for the past few months Boxycharm has been giving us subscribers nice products. The facial mask… do you mean the one in the July box? Did you even get that variant? Just wondering. The vlada stuff is on sale, I’m betting boxy picks up a bunch of items from the collection for August. The primer water would be nice to try! Yes I agree. The Primer Water would be Awesome to try. But NOT another Pallet for me. Yes! That’s exactly what I am thinking! Would love the Primer Water. OMG I love Laura Lee. Probably one of her liquid lipsticks would be amazing to have one of her palettes though. & I love Smashbox primer it’s my holy grail. Did he say if it’s a new palette? Another dang Pallet!! Why??? Way too many Pallets. I just might have to cancel Boxy and try Glossy Box and LookFantistic Box. So never redeemed charms before…what is the normal waiting time for shipment? Today is 2 weeks. Just curious if I should be patient or contact customer support. Whenever I have redeemed charms, they ship it right before sending out the next month’s box. So I would expect it before you receive your july box. Thanks! I’m currently waiting on a missorted Ulta package (going to end up being 19 days) so I’m overly paranoid now lol. I had to ride customer service to get my item I redeemed charms for. Eventually contacted my credit card company as I paid part of it out of pocket. After getting the run around for a week, they managed to ship within a few hours after my credit card got involved. I redeemed some of my charms for the first time 6-23. Got my order just today. Hmm….6 items. That’s great, but also suggests that one of the items is of low value. Probably another Jontblue liner. Either way I’m not complaining. My daughter enjoys those oddly colored things. Oh the dreaded jontblue! Was thinking the same! The last 6 items boxes were not as fab to me so I’ll be holding off for reveals. BC alawys ahve enough to cover the cost of the box, so as long as I like a couple things I am happy. The rest are bonus. Six items means more to play with! No complaints here! I always love boxycharm! Such a fun box and a wonderful “pick me up” after a hard day.